I model the transition era of the late 1950s. It was a time of distinctive automobiles, many of which are now classics. When you see early Thunderbirds and Corvettes, classic Chevy Bel-Airs and tailfins you immediately know the era. The 1958 Edsel advertising said “Once you’ve seen it, you’ll never forget it.” It’s a vehicle so distinctive that it was a “must have” for my Saint Louis Southern layout. Edsels were designed to bridge the price gap between the Ford and Mercury lines. The top-of-the-line Edsel Citation model came with deluxe interior appointments, extra stainless steel trim, and was even available with a tri-tone paint option. The Citation was based on a larger Mercury platform, lower-priced Edsel Pacers and Rangers were based on the Ford Fairlane platform. Unfortunately Edsels were too different, had too many quality issues, and arrived at dealers just when the country was in a recession. After three model years, the Edsel was gone. Front and rear of Oxford’s 1958 Edsel Citation. Wish it had local plates. Oxford has created a beautiful metal model of the 1958 Edsel Citation. Some modelers have commented that it looks big for HO scale, but that’s because it was a very big car in real life, based on the larger Mercury platform. It’s an accurate HO scale model. 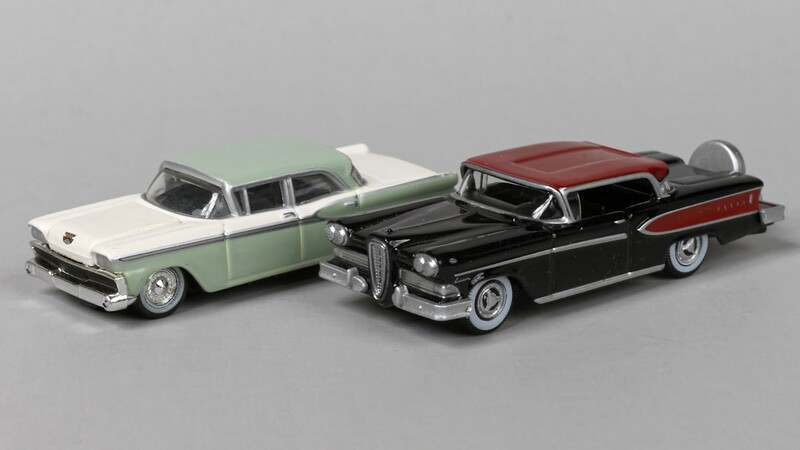 A comparison of Oxford’s 1958 Edsel Citation with Mini Metals’ 1959 Ford Fairlane. 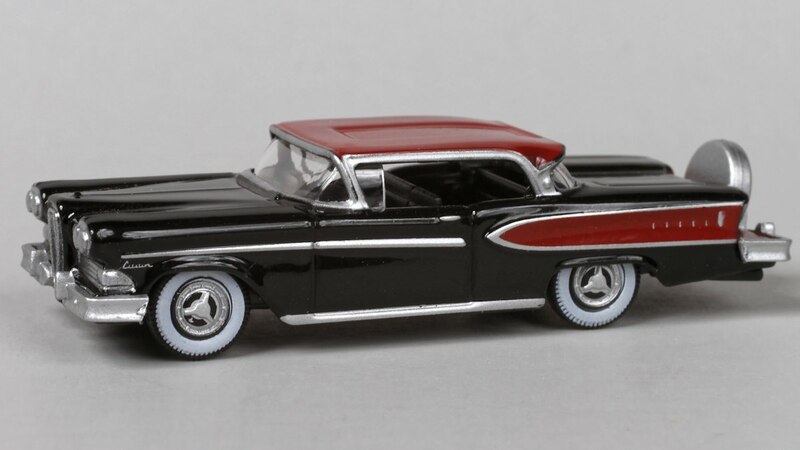 Besides the 1958 Edsel Citation, Oxford’s line of diecast HO vehicles includes the 1941 Lincoln Continental Convertible, 1949 Mercury 8 Coupe, 1956 Lincoln Continental Mark II, 1956 Ford Thunderbird, 1957 Mercury Turnpike Cruiser, and 1965 Ford Mustang Convertible. These HO scale automobile models retail for $9.95 each. I also discovered Oxford has a line of concession trailers. These are perfect for a circus modeler, and a single trailer will look great at a roadside event. 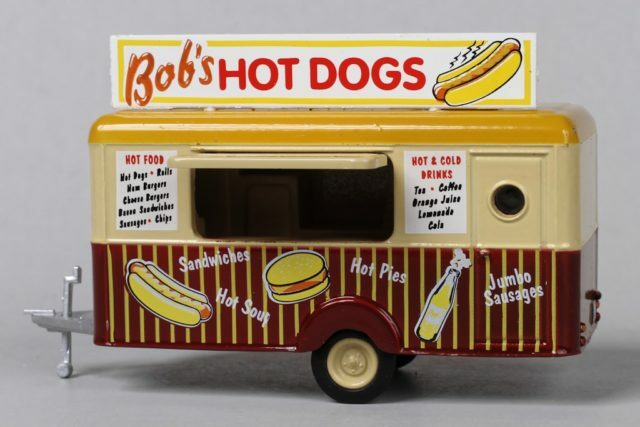 Oxford’s HO scale Bob’s Hot Dogs food trailer. Oxford offers five versions of their diecast HO scale food concession trailers: Bob’s Hot Dogs, Buns on Wheels, Hard Wok Cafe, Rings of Fire, and Benny Burger. The concession trailers retail at $12.95 each. 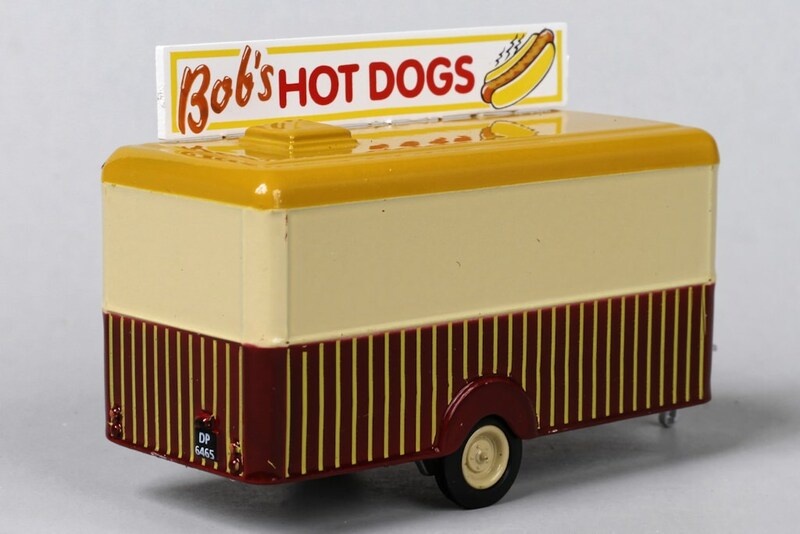 Rear side of Oxford’s HO scale Bob’s Hot Dogs food trailer. I purchased these two Oxford vehicles online from Walthers. Oxford’s vehicles are packaged in clear plastic boxes. The vehicles are attached to the packaging with two small screws.